A leading human rights group has criticised the US over the Abu Ghraib prison abuse scandal and the treatment of prisoners at Guantanamo Bay. In its annual report, Human Rights Watch says that when a country as dominant as the US openly defies the law, it invites others to do the same. 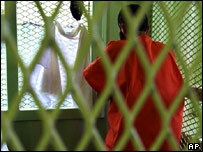 It says an independent US commission should look into prisoner abuse at Iraq's US-run Abu Ghraib jail. The report also calls for more military protection in Sudan's Darfur region. According to the New-York based group, abuses committed by the US have significantly weakened the world's ability to protect human rights. "The US government is less and less able to push for justice abroad, because it's unwilling to see justice done at home," said Kenneth Roth, executive director of HRW. Washington says it has condemned the abuse and is investigating allegations in Iraq and Guantanamo Bay. HRW accuses the Bush administration of failing to take responsibility for the treatment of prisoners in its war on terror, saying they "sought to blame the scandal on the young soldiers they sent to fight in Iraq and Afghanistan". 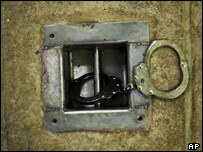 It also highlights the coercive interrogation techniques used on prisoners at Guantanamo and Abu Ghraib jail. "Governments facing human rights pressure from the United States now find it easy to turn the tables," said Mr Roth. "Washington can't very well uphold principles that it violates itself." The group calls for the Bush administration to set up a fully independent investigative commission, similar to the 9/11 Commission, to look into the Abu Ghraib allegations. US State Department spokesman Richard Boucher said eight investigations had already been completed and junior soldiers were being prosecuted. "We do not condone torture or abuse of prisoners," he said. "The actions of the administration have been quite clear in prosecuting this and investigating it and bringing it to light." HRW also accuses the world of showing "callous disregard" for the 70,000 people killed and up to two million made homeless in the Darfur conflict. 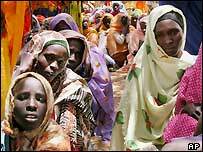 "Darfur is making a mockery of our vows of 'never again'," said Mr Roth. HRW singles out China and Russia - UN Security Council veto members - in particular for being more concerned about protecting oil contracts and arms sales to Khartoum than saving lives. The report says a large UN-authorised military force is needed to protect citizens, and criticises Western powers for handing the situation to the relatively inexperienced African Union. It also calls for an international criminal court to ensure crimes committed in Darfur do not go unpunished. HRW's 527-page annual report covers the developments in human rights in more than 60 countries in the past year. It found that human rights conditions remained grave in Iraq and Israel, and had deteriorated in Iran, with little sign of improvement in the rest of the Middle East. And though improvements were noted in several African countries, the report said concerns remained about governments' commitment to protect human rights.